Look, you don’t pick a Civil War costume so you could just stand around and chat about the chips and dip all night, right? You’re doing stuff in your costume! Super cool stuff like battle reactants or fort tours or museum exhibits! So you’ve gotta have the kind of costume that can stand up the heat of one of the most documented wars in American history. The kind that says, "Hey. I have thick non-fiction books in my apartment that I have actually opened and probably even read. I have also watched some Civil War documentaries on Netflix. Come at me." And that’s where this Union Kepi Hat comes in! 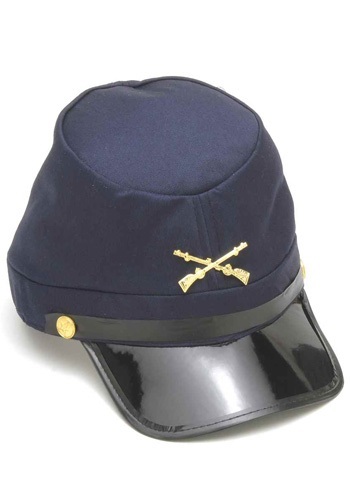 A replica of the "McClellan Cap”, it’s suitable for recreating those famous American battle scenes. Carry a replica or an authentic Colt Army Model 1860 and you'll be ready to assist your fellow soldiers and defend the Union on the battlefield!